Nursing jobs are in high demand right now as an aging population requires increasing care, hospitalization, and home healthcare support. For many medical facilities and organizations, that means difficulty in finding and hiring qualified nurses and filling nursing jobs. If you’re a medical facility owner or operator looking to fill nursing jobs and eastern Massachusetts on a full-time, part-time, or per-diem basis, Northeast Med Staff can help. Northeast is the leader in filling nursing jobs. As the demand continues to grow for qualified, experienced nurses, it helps to partner with the area’s leading provider of skilled, fully-licensed nurses, ready to fill a wide range of nursing jobs and beyond. Acuity in hospitals has been rising rapidly in recent years, due in large part to the declining average length of stay and to new technology that enables rapid assessment, treatment and discharge. Hospitals are increasingly becoming large intensive care units, with cardiac monitoring, respiratory assistance, and intense treatment a growing part of the average patient’s plan of care. As a result, skilled and specialized nurses are in great demand and nursing jobs and elsewhere difficult to fill. Northeast Med Staff is helping solve the problem by providing highly-qualified nurses looking to work schedules that fits their lifestyles and personal needs. Because Northeast Med Staff screens and hires nurses based on full-time, part-time, and per-diem needs, it can fill nursing jobs with appropriate, qualified professionals fully-prepared to work within the specific staffing needs of Northeast’s medical facility clients. 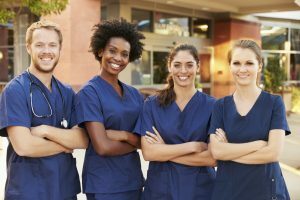 If you’re faced with a staffing shortage or unexpected scheduling changes that leave you periodically short-handed, Northeast Med Staff can help you fill those nursing jobs with the right nursing professionals to meet your needs.